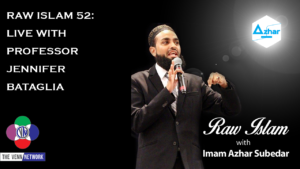 This week on the Raw Islam Podcast with Imam Azhar– a 2017 Podcast Award nominated podcast, Imam Azhar is live from the University of Tampa with Professor Jennifer Bataglia and they are talking about the Parliament of World Religions. As this episode opens Imam Azhar introduces us to Professor Bataglia who is the professor of World Religions at the University of Tampa. We get a brief bio on the Professorn during which B.C. Dodge and her make a New England connection – if you didn’t know New Hampshire has no sales tax. We learn that Imam Azhar attends this class about once a year, to allow the students to speak with him directly after they study the section on Islam so that they can ask their question of an Imam – rather than getting their information from Google, because that isn’t always the best source of information on things…cause you, Fake News. The Imam recalls something he heard from one of the parents of the children lost at the shooting in Parkland, which was that rather than focusing on our differences, we should focus on our commonalities. It is that which will bring us together, where as, if we focus on just our differences, that will pull us further apart. Imam Azhar highlights the current issues in Myanmar to explain his point. He says that if this was all we knew of Buddhist one would think ill of them. But it is thought education that we will gain a better understanding of each other, which will help move us along as a society. And this is then becomes the job of Professor Bataglia. Professor Bataglia goes on to say that when they talk about Myanmar and the Buddhist in her calls that most of the class is shocked, because they didn’t know anything about this. She says that there is a disconnect between the purity that of the message that world religions deliver, and the fallibility of the humans executing that message.